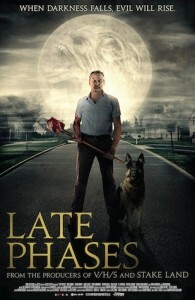 What you're looking at here is the official one-sheet for Late Phases which is getting some play at SXSW and will be arriving this year for you all to check out from Dark Sky Films. It's the latest project from director Adrian Garcia Bogliano who gave us Here Comes the Devil last year. Nick Damici, Ethan Embry, Tom Noon and Erin Cummings star.